Designed by a scientist, the original Hawai'ian Collection Resort Pants(TM) provide full coverage and excellent modesty both in and out of the water. They have an internal drawcord that stays out of your way, a low-profile back zipper pocket to store your key, and the straight-leg styling offers a relaxed look. They sit comfortably at the waist above the hips (not 'hip huggers') and the pant length falls at the ankle to provide freedom of foot motion during swimming. All Splashgear swim bottoms are designed to be worn over your own one-piece bathing suit or tankini. These pants can also be worn over more tight-fitting clothing (such as a wetsuit or a lycra skin suit) for more modesty. NOTE: Pants must NOT be longer than ankle length for in-water safety reasons. If pants fall past your ankle, please try one size smaller or contact customer service. Due to specially designed hems at the leg opening, these pants cannot be hemmed normally. Tested using the AS/NZS 4399:1996 protocol. 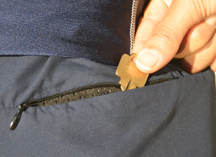 Invisible rear zipper with mesh pocket for easy drainage. Offered in two colorways: a solid pair with print side accents ($40.00); and a printed pair with solid side accents ($42.40). Keep in mind that our swim pants are cut generously. Deliberately purchasing oversized Splashgear clothing is unnecessary and you may be unhappy with the performance of your oversized swimwear. We suggest that you purchase swimwear products in your size for best fit and function. In fact, the most important measurement to decide your size in the Hawai'ian Collection is the INSEAM. The drawstring waist for all the swim bottoms opens very widely to accommodate different sizes and shapes and is generous in the waist and thighs; but because the pant leg openings cannot be hemmed normally, the inseam should be used as the first measurement to decide your size. That is why if your measurements fall in between two sizes, we suggest that you choose the smaller size. Assalaamu alaikum and Ramadan Mubarak! I received my order today. Once again Splashgear has delivered a quality product. Thank you so much for your awesome customer service and gifts! I am so excited to wear my new resort pants and continue to spread the word about your wonderful company. Mashaa'Allah! (As God has willed!) This swimwear is great and comfortable too. The fabric doesn't hold water, so it remains modest. And a Muslim woman wearing this does not have the worries a woman wearing immodest swimwear has such as bikini riding up, etc. Thus, freedom and the ability to swim/exercise to stay healthy! Freedom from quarts of sunscreen and from fear of body parts escaping from your swimsuit! I am an older mom (45 years) with a high energy preschooler. With my Splashgear suit I can truly enjoy my time in the water with my daughter and keep up with her without worrying about body bits popping out. I thank you! My daughter thanks you! Blessings to you and yours! Assalamu alaikum (Peace be upon you)! I am a very happy Splashgear customer whose only complaint is the lack of availability of your product!!! I just want to thank you for making such an amazing product. Thanks to you, I am able to enjoy every single weekend in the pool with my 3-year old son. As a former lifeguard and avid swimmer turned more observant Muslim, I have found your product to be high performing, stylish and modest. My search for an Islamic swimsuit ended when I found your site. Thank you, thank you, thank you! Now if I could only get my hands on one more pair of swim pants! Copyright © 2014 Splashgear LLC. All Rights Reserved. Online Store by Volusion.